When it comes to eating seafood, crab is one of the finest in selection. The flesh is buttery, sweet and meaty. From the Pacific Northwest to the Atlantic coast, people have long enjoyed eating crab, cooked in hot soups, chilled in salads or boiled for outdoor crab feasts The meat is such a sought after delicacy it’s no wonder crab cakes are considered an all-time favourite; small cakes filled with chunks of crab meat, cooked until golden and topped with any number of flavourings from the classic red cocktail sauce to sweet and tangy tartar to spicy mayo. They are delicious shared for an appetizer, or as a main course paired with a crisp, light salad. Good as they might be, more often than not, the crab in the cake doesn’t get enough credit. It’s not the crab’s fault either. It’s what’s been done to the crab cake that is ruining it’s reputation. There’s far too much debate on how a crab cake should be cooked – baked, pan-fried or deep fried, and what to bind the cakes with – be it egg, crackers, potatoes or breadcrumbs. Of course, then comes the toppings – should it be a salsa, crisp greens, mayonnaise or hollandaise? Well who cares! If you don’t make the cake right, no amount of fillers or sauces can correct that. Proper crab cakes should let the crab do the talking. They should be loaded with tender, lumpy crab meat, not saltine crackers. You want the whole kit and kaboodle too, body, leg and claw meat. And if you’re making them at home, be sure to select healthy, sustainable seafood such as the Alaskan King, Dungeness, Blue or Snow crab. And no matter what, make sure your crab cakes find a harmonious balance between sweet and salty, and a tender, juicy inside with a crisp, crunchy outside. Blue Crab’s signature cakes are made with a mixture of Rock crab and shrimp. Of the 9600 dried ingredients, 9100 of those are crab. The result, is a true crab cake with just enough binder to keep them together. They are simple and amazing. 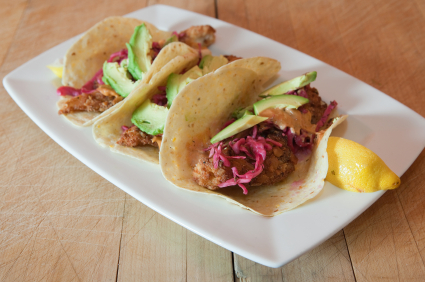 Served with lemon dressed greens and chipotle mayo – $17. These scrumptious little morsels are made with sockeye salmon, halibut and crab. Nevertheless, the Polpette di Granchio e Salmon (available on the lunch menu) are still full of sweet crab meat and baked to perfection with a hint of herbs and curry spice. Served on a salad of butter lettuce with avocado, cucumber and mango salsa for $14. Divine! On the dinner menu the crab cakes are featured as an accompaniment to the fresh Cannelloni, a rich, creamy pasta stuffed with butternut squash in a mild coconut curry sauce, topped with mango salsa $21. Located in Waddington Alley, directly behind Willie’s Bakery at 537 Johnston Street. Pan seared crab and shrimp cakes served with fresh mango salsa are the house specialty at the Flying Otter Grill. Three to a serving they are excellent for a light meal or as an appetizer – $15. 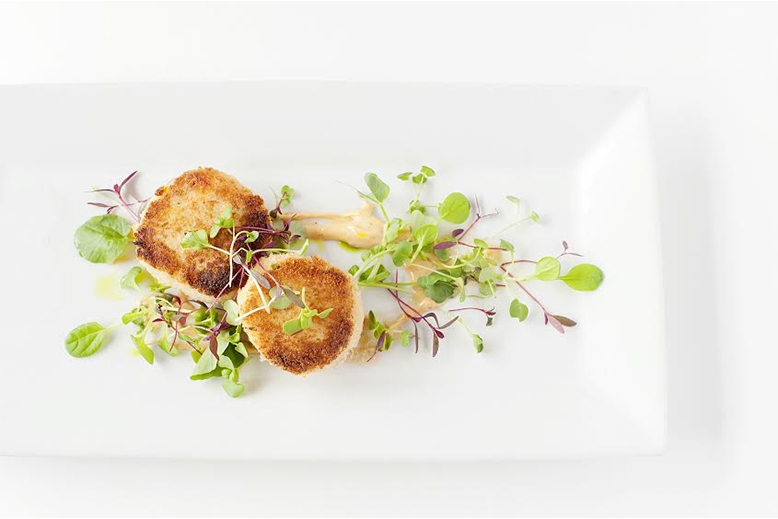 A popular menu item, Lure’s crab cakes are prepared with Dungeness crab and pureed scallops. The outside is nice and crispy with the addition of a panko breading. They are pan-fried until golden and served with a pear and apple relish and a grainy lime and mustard seed mayo – $14. 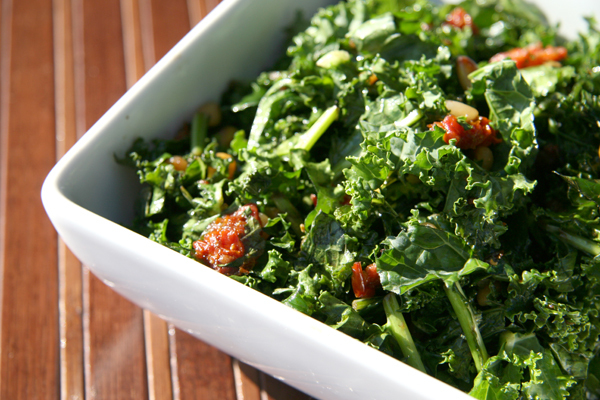 A perfect share plate or as an addition to any salad. Pescatores crab cakes are fresh, light and balanced. Made with Dungeness crab and hand peeled shrimp these cakes have a nice zest from red and green onions, lemon zest and cilantro. They are breaded with panko and served with a fresh avocado salsa that is nice and citrusy. The addition of a house mad harissa mayo adds the right amount of heat – $17. Delicious! Place all ingredients, excluding the panko bread crumbs, into a stainless steel bowl and mix together remembering to season generously with salt and pepper. Place mix into stainless steel ring molds and preheat oven to 375 degrees. On a plate, spread the panko out evenly, generously covering both sides of the crab cake. On medium heat, place a frying pan with 10ml of canola oil. Once it has reached the smoking point, place crab cake into the pan, presentation side down until golden brown. Flip crab cake over and place in pre-heated oven for approximately 4 minutes. Remove crab cake from oven and place on plate. Use a spoon to tap side of the ring mold until crab cake releases. Serve with a small fennel salad, and top with ½ tsp of tartar sauce. Ensure everything that needs chopping is finely diced. Put all ingredients into one bowl and mix together. Add salt and pepper to taste. Chill before serving. 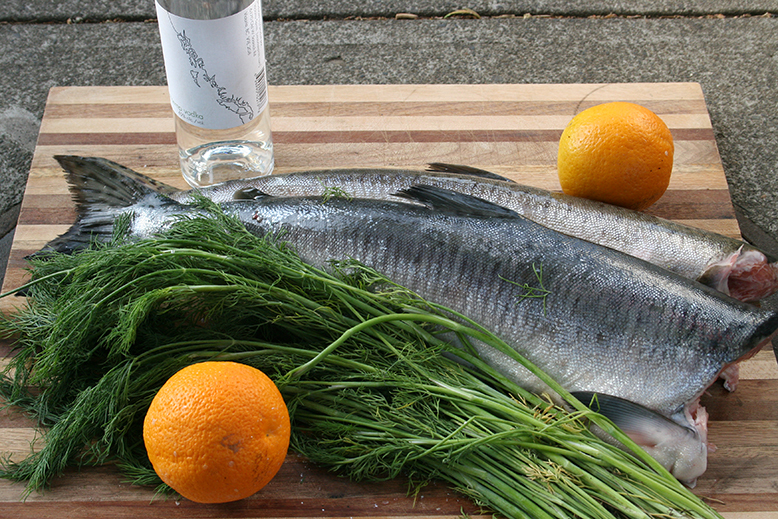 When slicing the head of fennel, keep some sprigs to the side.Mix all of the ingredients together and toss with orange vinaigrette. To be placed on the side until crab cake is complete. Create a Mother’s Day Brunch centerpiece, then eat it.